We’ve heard it all before: “This bike’s for going fast, that one’s for having fun.” “This one pedals well, that one shreds.” Why not make one bike that does everything well? Well, we did, and it's called the S-Works Stumpjumper. Unrivaled handling and stiffness, sublime suspension kinematics, and a complete abandon of proprietary nonsense—it rides like a dream. And with 29-inch wheels, you’re free to climb and descend at the hyper speed that 29ers are known for. Our design goal for the new Stumpjumper was simple—build the ultimate trail bike, one that feels telepathic. And it turns out that this feeling all comes down to stiffness. Think of it this way: when the frame's telling your hands one thing and your feet another, your brain gets confused with the imbalance and the bike feels unstable. In order to fix this, we had to get to work on dialing-in the materials, shapes, and the layout. We’ve heard it all before: “This bike’s for going fast, that one’s for having fun.” “This one pedals well, that one shreds.” Why not make one bike that does everything well? Well, we did, and its called the S-Works Stumpjumper. Unrivaled handling and stiffness, sublime suspension kinematics, and a complete abandon of proprietary nonsense—it rides like a dream. And with 29-inch wheels, you’re free to climb and descend at the hyper speed that 29ers are known for. Our design goal for the new Stumpjumper was simple—build the ultimate trail bike, one that feels telepathic. And it turns out that this feeling all comes down to stiffness. Think of it this way: when the frames telling your hands one thing and your feet another, your brain gets confused with the imbalance and the bike feels unstable. In order to fix this, we had to get to work on dialing-in the materials, shapes, and the layout. Steps were also taken to make this bike easy to live with. Threaded bottom brackets make a triumphant return, and we made room for up to a 3.0 tire. Youre also free to run whatever aftermarket rear shock you want, since were using standard metric shocks. We revamped the SWAT™ box, too, making it sleeker, lighter, and with more volume. And customization is furthered with a Flip Chip that lets you to dial-in your Stumpy to your riding style. Switch it from High to Low and it drops your bottom bracket 6mm and slackens the head tube by half-a-degree. Little details also jump out to surprise you, like a newly designed ribbed chainstay protector that makes chain slap a thing of the past and nearly silences the drivetrain. Lastly, we seriously couldn’t make cable routing any easier on carbon models. Full tubes can be found throughout the carbon frame, so all you have to do is push the cable and it’ll come out the other end. No more lazy loop, hidden stashes of magnets, pokey spokes, or pillows to cry in. The Stumpjumpers asymmetrical, FACT 11m carbon fiber construction is lightweight, stiff, and ready to take on the trail. Its built off our 29 Trail Geometry, so its just the right amount of both capable and comfortable. And with SWAT™ integration in the down tube, a threaded BB, easy cable routing, and an all new chain silencer, its ready for anything the trail, or you, throw at it. FOX FLOAT DPX2 Factory has three modes—Open, Trail, and Firm—that control large compression adjustments on-the-fly. Theres also a tool adjust compression adjustment that allows for fine-tuning of the compression in Open mode. 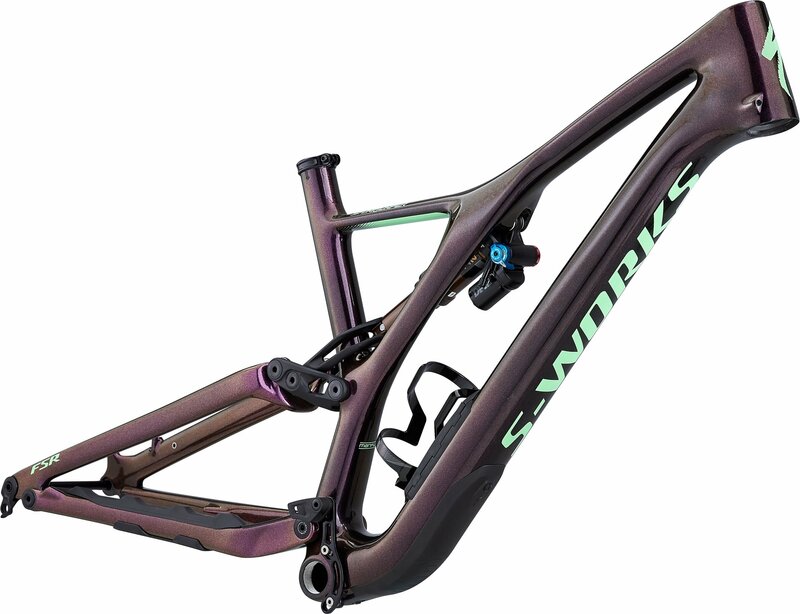 Please see below for delivery options for Specialized S-works Stumpjumper 29er Frame Only 2019.